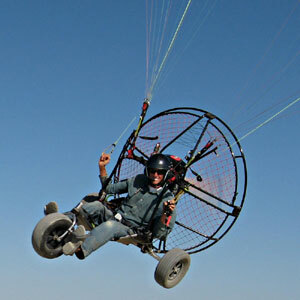 TrikeBuggy - The Magnificent Microlight! Ever dreamed of flying? Of course you have, that's why you're here! But what sensation do you feel when you fly? Is it seated inside of a cockpit with your hands on a steering wheel or joystick? Not exactly the most intuitive or realistic connection to controlling the wing. Meet the TrikeBuggy! With this simple PPG Trike, the control of the wing is as natural as a bird - dip your left arm like the wing on a bird, and your craft turns left! Look right and lower your right arm and you turn right. Level flight is done by having a relaxed, light touch of the hands on the toggles while the gentle flare needed to gently set the vehicle down is done by simply applying both brakes just as you approach the ground. Totally intuitive and completely natural feel compared with any other aircraft available today. What is a PPG Trike? 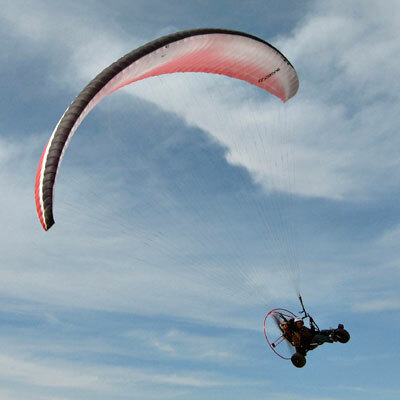 A PPG Trike is simply a powered paraglider backpack motor unit mounted to a three or four wheeled foot steerable trike, using a standard paraglider wing to achieve flight. A PPG Trike is light, around 100 pounds including the motor and trike. Motor size is anywhere from 100cc to 325cc, and the backpack motor is removable for foot-launched flight as well (with the same wing). PPG Trikes have been around for awhile, and their designs are many and varied. PPG Trikes all share many of the same benefits, but few are built to very robust standards. Some use cables to make the frame rigid and to give the trike a suspension. Others use carbon fiber or fiberglass axles to absorb shock. The biggest drawbacks to most are ease of use and overall durability. Trikebuggies have also been around for awhile, but the problem is that pilots were simply bolting their PPG motors onto the buggy and sitting in their harness, still attached to the motor. The result was a lot of bent comfort bars! Once these were repaired with a stronger material, the pilot could sit in their harness suspended from their motor. Then the problem was that the harness sat you up so high that you felt like you were sitting in a high chair! The center of gravity was very high, and these trikes were prone to toppling over quite easily. The trike offered virtually no protection in case of a rollover, and a lot of pilots ended up with scrapes and bruises (or worse!) from tipping over. Also, getting in and out of this design meant wiggling into your harness while it is attached to the trike. When launching, the wing picks you up by the harness, carrying the motor and finally, the trike along with it - changing and destabilizing the whole balance of the aircraft when going from taxi to flight. The front end literally falls away from your feet upon launching. There had to be a better way! 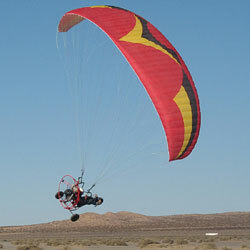 Our Trikebuggy utilizes a stainless steel kitebuggy made solid by Flexifoil for the rigors of traction kiting. Kitebuggy riders often jump their buggies ten feet or more in the air, slamming the trike back to the ground again and again. Few PPG Trikes would stand up to this kind of abuse. Our signature Power Loops attach the buggy to the motor frame so that the pilot can actually sit in the buggy seat and fasten a simple seat belt - easy in, easy out, and very secure. The center of gravity is low, and the seated position is very comfortable. Plus, the trike doesn't feel like it is going to implode every time you put your weight on it. Launching and landing this little jewel is simply fun and enjoyable, since the balance is good both on the ground and in the air. The TrikeBuggy is an aircraft that is just big enough to carry the pilot and his gear, nothing more, nothing less. Unlike the PPC's that are massively overbuilt and overpowered, the TrikeBuggy is a personal aircraft. It has the power to climb as well as any good ultralight, and has the gliding performance to enjoy some quiet engine-off time. Being small and light has its advantages - it can be transported fully set up in a 6x10 foot trailer, or disassembled to fit into the smallest cars. If you have a pickup truck, it can be carried in the bed, and setup time is often under 5 minutes from arrival at the airfield. Light is also an advantage, and the TrikeBuggy comes in weighing much less than the 254 lb. limit for ultralight vehicles to operate under Part 103. Speaking of legal, many ultralight pilots are now looking for a way to continue the enjoyment of flying but are not interested in getting their Sport Pilot license to fly their heavier aircraft. With the TrikeBuggy, no license is needed, but a couple of days of good training and instruction will usually save money in rollover expenses. The TrikeBuggy is great for anyone that is concerned with trying to run out a launch in zero wind with a 60 lb. throbbing motor and spinning propeller on their back. With the TrikeBuggy, you simply sit down, fasten a seat belt and throttle into a taxi run while rolling on soft wheels made smooth with high-speed bearings. The takeoff can be done at full speed without the fear of falling down and risking injury. Landings are a breeze as well, since you can simply roll to a stop from touchdown, again at near full speed without concern. Gone are the days of dreading the landing in no wind, risking ankles, knees, props and cages. FOG's (Fine Old Guys) and women do well with the TrikeBuggy also, since it doesn't require one to be a bodybuilder to operate! Anyone with a prior injury, bad shoulder, weak knees or back problems can fly this aircraft all on their own. Having a low center of gravity has another advantage also, and that is protection in case of a rollover. Because the seat is so low, it positions the body in the center of the circle made by the cage. The trikeBuggy can literally roll all the way over, and as long as you keep your arms and legs in, the frame and cage will protect you. Of course, if you hit hard enough, you will break your cage, propeller and perhaps more, but that's what technique is all about. There's no other PPG Trike out there that will take hard landings as well as the TrikeBuggy. Versatile? Remember that the TrikeBuggy is made from a kite buggy, so when the wind comes up too strong for flying, we can remove the PPG motor and break out the traction kites for some wind-driven fun! Development of the TrikeBuggy started with the Classic, then progressed to our Bullet. 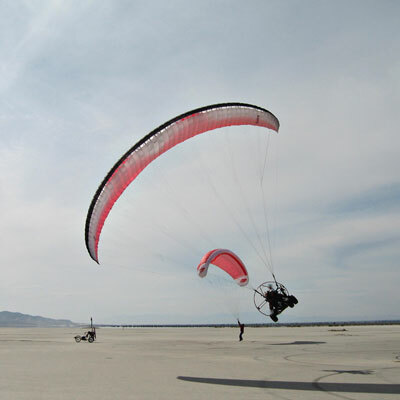 We now offer a TrikeBuggy Delta for use with a hang glider and the Transformer, a version that can be changed from paraglider to hang glider in about five minutes! We also have a four-stroke Thumper for those wanting a reliable cross country flying machine. When researching flying machines, consider all the options; ease of use, comfort, durability, versatility and sensation. The TrikeBuggy is simply the ultimate PPG or Delta Trike, or BOTH!